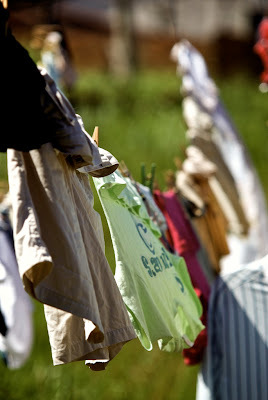 CLOTHES DRYER: After reading it is a home's second biggest energy-consuming appliance (after refrigerators), I decided to boycott my clothes dryer. Mostly. Only rarely do I toss in sheets and bath towels—often I hang even those to dry. I bought a snappy little plastic thing for $1 from a charity-operated resale store. It unfolds like an umbrella skeleton, eight outstretched arms, each with two clips from which I hang lingerie and socks. Underwear doesn't go in the dryer because it destroys the delicate fabrics and shaping. And good lingerie is one thing Broke Girl believes is worth investing in. Never cut short on the construction, fit and quality of your underthings. In addition to reducing utility expense and wear on clothing, I like the surge of humidity the clothes throw off in the wintertime—and they dry super quick. If Broke Girl were not an Urban Girl, she might hang her clothes in the great outdoors. But I wouldn't go crazy like the Amish farms I passed on a freezing morning in Indiana two weeks ago. Snow was falling and icicles were forming on the dark blue dresses, bonnets and black pants stiffly hunkered together on washday. Ow. Frozen underpants, no thank you. With Elfa closet components I picked up for a few dollars from Craigslist.com, and the one tool a Broke Girl should never be without (corded electric drill) I installed shelving and a clothing rod over my washer and dryer from which I hang wet pajamas, tees, dresses, pants and more on plastic hangers to dry. I strung a clothesline to the opposite wall over which I drape bath towels and sheets, the latter which I have occasionally taken to ironing while still damp (with a spritz of lavender linen spray) so they press beautifully. So when I mentioned this last week to my gal pals they shrieked in horror. Which unleashed a 20-minute conversation that ranged from perceived childhood abuse by forced ironing to the girl who had never heard of such bizarreness. There are more substantial clothes drying racks than the one in your picture that will work inside during the worst Chicago winter. It also gives the added benefit of adding a little extra humidity into your home making it feel more cozy.